Kettlebells, a cast iron, cannonball shaped dumbbell have been used for years in Russion physical education military training classes for years. The intense and effective workout they help you get have made them popular with coaches, athletes, and fitness enthusiasts around the world. The primary reasons like Kettlebells is that they’re a great way to add variety to your workout and improve pretty much every aspect of fitness including your cardiovascular fitness and muscular flexibility, power, and strength. One of our favorite Kettlebell exercises is the Kettlebell Swing. The great thing about Kettlebell Swings is that they are a total body movement. All of your major muscle groups (legs, low back, abs, back, chest, and shoulders) are trained when doing this exercise. They can be done with both or just one hand holding the Kettlebell during the exercise. This post provides all the information you need to learn how to properly perform the Two Handed Kettlebell Swing. We’ve also included two workouts that show you how you can incorporate this awesome exercise into your workouts. Check out this video to learn how to properly perform Kettlebell Swings. In it the instructor shows you how to do Kettlebell Swings using an easy to understand, step by step process. This workout is based on research that finds exercising very intensely for several brief sets of an exercise helps your body to burn tons of calories for several hours post-workout. This workout is great for taking off excess body fat, often with better results than regular, steady state cardio. Be forewarned, this workout is brief but very, very intense. If you are just getting into shape you may want to start off slowly by doing fewer sets or resting longer between sets of swings. Do them first in your workout 3 times a week for the best results. Since its super intense, use a weight you can pretty easily use tp properly do 20 swings. This is a way to get a quick, total body workout in with no equipment required other than a kettlebell. You can also do this circuit as a warm-up before you lift weights. Do each of these exercises one after the other, rest for 2-3 minutes and repeat for 5 or more sets. Click on the link for Kettlebell Rows to watch a YouTube video that shows how to perform them properly. 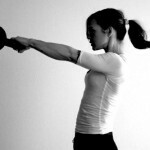 Check out this article if you’re interested in a kettlebell workout for weight loss. If you belong to a gym or fitness center its very likely that they have Kettlebells you can use. You can also buy a pair or two or three for yourself in a variety of weights and styles. If you train at home, even if its just on the rare occasion you can’t get to the gym at least one pair of kettlebells is worth owning. We really like the First Place brand of Kettlebells because of their sturdy construction, easy to grip handle, and great price. You can get them in weights ranging from 4 to 44 kilograms (9-97 pounds). 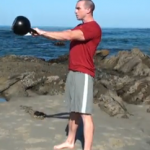 Ready to add Kettlebell Swings to your workout? If so, click here to buy First Place Kettlebells at PerformBetter.com. Since kettlebell swings are a total body exercise they require lots of energy, focus, and endurance you want to make sure you’ll have plenty of each before you do your first rep. The right sports nutrition supplements can make sure you have plenty of each. Below are a few of my favorite workout supplements that will help you workout harder, longer and reach your goals faster.